Why should I Use Commercial Security Cameras? How to Install a Magnetic Door Entry System? Security Camera King is a high-quality provider of HD security video recorders, HD Security Camera, Network IP cameras, CCTV accessories, and premium access control systems. Our company began primarily as security system technology installers. Our business revolved mainly around the expert integration of professional CCTV equipment, network optimization services, and the installation of related technology for both residential and commercial locations. Today Security Camera King has partnerships with some of the industry’s top manufacturers in order to provide our customers with high-end security products at fair prices. Security Camera King carries various kinds of access control systems for the convenience of our customers. We are the go to security product providers if you have been looking for a high-quality magnetic door entry system for your property. We have magnetic door entry system technologies with capabilities of up to 1500 lbs of resistance. The first tool that you will need in order to do perform a magnetic door entry system installation is a drill with an appropriately sized drill bit. It is very important to remember to use a proper masonry drill bit if you will be drilling into hard concrete or brick surfaces. A ruler and pencil will help you proficiently mark the position of your new magnetic door entry system. The final tool we recommend for installation should be a simple Phillips screwdriver. All the appropriate screws should come packaged with your new magnetic door entry system. You should begin the magnetic door entry system installation with the thinner metal portion of the electronic lock which will be attached to your door. Before you drill the plate into position you should mark off the selected area with the ruler and pencil in order to ensure that this half of the lock isn’t incorrectly placed. In order to properly account for the lip of the door frame, you should first close the door before proceeding to make the markings with the pencil. It is important you complete this portion of your magnetic door entry system installation as directed (with the door closed) in order to ensure that you do not accidentally mount the slab to the very top of the surface and prevent the door from properly closing. Once you have the positions of where your screws should be placed properly marked we can begin to drill the holes for the screws to fit into. Once you have determined the appropriate area and finished drilling the holes that you will be screwing into you can begin to mount the thinner metal plate portion of your magnetic door entry system to the door using the proper screws or fitments. Before you move onto the final tightening of the screws on this half of your system you should open and close the door in order to double check that everything is still flowing smoothly. If all is as expected you can go ahead and finish the tightening of the screws. The next portion of the installation involves the mounting of the actual electromagnetic lock. In order for your magnetic door entry system to properly function it is exceedingly important that there is a thorough connection established between both halves of the system. This means that you should take extra care into ensuring that the area is properly marked off before mounting this portion of your EM lock. To begin your door should be closed once more in order to determine exactly where the first metal plate is sitting in relation to your door’s frame. A good tip to follow during this portion of the installation is to power your magnetic door entry system and have the two halves of the system clamp onto each other. You can then easily mark the position of the thicker half of your system with your ruler and pencil and guarantee that you the correct position identified. It is important to account for any wires coming off of this portion of your EM lock in order to drill the appropriates holes to run the cable through. Once you have properly run the wires for your magnetic door entry system and ensured that it is a flush fit onto the marked area you can tighten the screws and fix it into place. You can now power on your system as you’ve completed the installation portion of your brand new magnetic door entry system. Security Camera King is the premium solution if you have been looking for a trusted security product supplier for a new magnetic door entry system. We carry some of the best security provision technology in the industry. 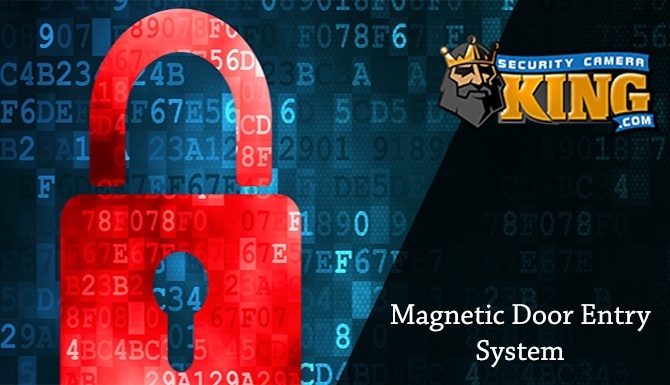 Contact our experts at Security Camera King for help ordering a magnetic door entry system or to have any inquiries professionally addressed.